If you are my Facebook pal, my Facebook Friend, my Facebook compadre…then you saw this pretty blue table in a sneak peek not too long ago. It started out as this plain before……. I think it originally had a glass insert but I liked the paneled wood and thought it would enhance the after without glass. A.K.A….I am too cheap to buy replacement glass. This paint turned out so pretty! 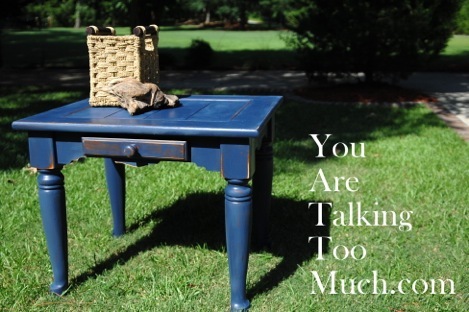 The blue was from Valspar’s new sample line…which I love. DUH! GENIUS! Why didn’t they do this before? Still the same cheap price for the samples and still go a long way. I was able to get this piece out in my “Workstation 101” batch and it dried fast and I finished from start to finish. Making it easier to put out multiple pieces at one time. I didn’t prime my surface and did two light coats, then distressed away and finished up with wax. Have you seen the new samples? While you are pondering your answers to these questions, would you say a quick prayer? I am right now, as you read, in the air on the way to Spain with my son! Which means, that I am right now, as you read, wondering why I didn’t clean out my closet in case I die. Those are the kinds of things that actually rattle through my brain when I travel. I am at this moment worried my friends will think I am a pig if they have to come in and clean out my closet for my husband. They will know that I fluctuate between four sizes and have a hard time letting go of old bras. I am, right this very minute, imagining my funeral with tear filled eyes and writing emails to family and friends, in case of such a terrible situation. They will be left “up” on my computer screen in case my son is given my lap top when I am found run over by a bull in Spain. I am really fun to travel with. Maybe you should say a prayer for my son and what he has to put up with. So, say a prayer and let me know what you think about the table. Love the color and distressing on the table! Sending prayers your way. I can totally relate. Prayers offered your way! Have a great trip! Prayers sent your way, table is fabulous. You are in good anxiety-filled company when traveling. God bless you guys, have fun and puleeze take pics for us back here at home. love that blue!!! so, lowe’s has valspar samples, pre-mixed in colors?! I did not know that… fabulous! I will have to check it out. I LOVE the Valspar, in my opinion it is the best WALL paint EVER, but I have yet to try it on furniture… THANKS for the fun laugh and the inspiration today!! you are always so great for both! I assume your fears were for naught, and you and your son have arrived safe and sound.my sister and I have an agreement in case of either of our untimely deaths, wherby we rush to the others’ home, and do a quick sweep of the area, before anyone sees what our real life looked like!! !